How much is my California spine injury claim worth? When people suffer spine injuries in accidents, they might be left to face a lifetime of disability. Spine injuries may range in severity and include everything from bulging discs to partial or complete severing of the spinal cord itself. If you have suffered a spinal injury that was caused by the negligence of others, it is best for you to talk to an experienced personal injury lawyer for help with recovering the damages that you deserve. There are several types of spinal injuries, including bulging discs, herniated discs and partial or complete tears of the spinal cord. Bulging discs may cause stenosis, which is an impingement of the nerves that lead into and out of the spinal cord. This can be extremely painful and make it more difficult for people to be mobile. Herniated discs may also be caused by accidents. Between the vertebra of your vertebral column, you have discs of cartilage that help to prevent the bones from rubbing against each other and also provide space for the nerves to travel into and out of your spinal column. When the discs bulge, they have slipped outward and may pinch the nerves. The centers of the discs contain a jelly-like substance that acts to cushion the vertebra. When your discs herniate, they are cracked and some of this fluid leaks out. Both conditions are quite painful and may limit your mobility. Finally, in serious accidents, spinal cords may be partially or completely severed. When this happens, the victims may be paralyzed in all of the areas beneath the tear. 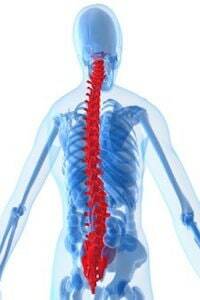 Some people who suffer severe injuries to the spinal cords may also die. Spinal cord injuries may occur when there is sudden trauma to your back. They commonly happen when people fall because of dangerous conditions that exist on the private or public property of others. If the dangerous conditions are ones that the property owners should have known or about which they did know but did nothing to correct them or to warn visitors of their existence, they may be liable to pay damages in a premises liability lawsuit. Motor vehicle accidents are another common cause of spinal injuries. When the physical forces of a collision cause injury to the back, the victim may be able to file a personal injury lawsuit against the driver or drivers responsible. Finally, other situations may also happen that cause spinal cord injuries such as diving accidents, sports injuries and other similar incidents. Spine injury cases vary widely in what they are worth. Some examples of verdicts in California illustrate how the value of claims may differ, depending on the facts and circumstances. In Shawna Davi; Christopher Paulson v. Amel Sediri; Jacob Holm Industries (America), Inc. , Los Angeles Superior Court Case # BCS34274, the plaintiff was injured in an automobile accident when an employee of the defendant made an illegal lefthand turn and struck her vehicle. She suffered an aggravation of her previous disc herniations along with some bulging discs. The jury awarded her $537,000. In Jane Doe v. Landis et al, Sacramento County Superior Court Case # 34-2012000133121, a 56-year-old woman who had pre-existing back and disc problems suffered an aggravation of her condition in a rear-end accident. The jury returned a verdict in her favor of $359,485. In Susan Oby, Robert Oby v. Save Mart Supermarkets, Sacramento Superior Court Case # 34-2015-00176138, the plaintiff was awarded a verdict of $215,000 after she slipped and fell in a puddle of water from an air conditioner inside of a supermarket. She suffered chronic disc problems and soft tissue injuries to her back and to her neck from the fall. In Brian Leierer v. Harris Salinas Rebar, Inc., Alameda Superior Court Case # HG 13679708 awarded a gross verdict of $10.7 million to a worker who fell from a bridge while he was working on the job and suffered bulging discs as a result. The jury found that his employer was 49.5 percent at fault and a third-party contractor was 49.5 percent at fault. The man was able to recover workers’ compensation from his employer and the percentage of the gross award that was attributed to the third party from the contractor. In Kayleigh McCall v. Coast Line Distributing, Inc. and Paul Anthony Ceja, San Luis Obispo Superior Court # 14CV0535, the jury awarded a plaintiff $2.1 million. The plaintiff was struck from behind by a semi-truck driver who was on drugs and suffered a traumatic brain injury as well as herniated discs in her cervical spine. Of the total verdict, a little more than $1 million was ordered as punitive damages against the driver’s employer because the company hired the man despite his extensive drug history. In Allison Jean Bradley v. Bassco, Inc., Superior Court of Sacramento County Case # 34-2013-00149232-CU-PA-GDS, a woman suffered disc injuries in her lumbar region along with hip, knee, teeth and facial injuries. She was struck from behind by a Ford truck that was being driven by an employee of the defendant. The company admitted that it was liable but disputed her back injury claims. The jury awarded her $2.8 million. In Lori Triplett v. City of Los Angeles, et al., Los Angeles Superior Court Case # BC518329, the 56-year-old plaintiff slipped and fell after she stepped in spilled coffee at the airport, suffering a herniated disc and a labral tear. The jury awarded her $2 million. In Joanne Turner v. Sundt Construction Inc., et al., Yuba County Superior Court Case # YCSCCVPO12-0000556, the plaintiff was an electrician who fell from a roofline at a job site because a faulty ladder was supplied to her. She suffered serious leg and back injuries, including disc herniations. The jury awarded her $5.2 million. In Plent v. Anheuser-Busch, LLC, Los Angeles Superior Court Case # BC551113, an 86-year-old woman who was hit from behind in a grocery store by an Anheuser-Busch employee with a merchandise cart suffered an exacerbation of her back injuries from a pre-existing degenerative joint disease. The jury awarded her $886,000. In Mariolle v. Volvo Truck, Consolidated Metco and Wittke Manufacturing, U.S. District Court, San Francisco Case # 09:1209 MMC, a truck driver suffered bulging discs when a defective wheel hub failed. He sued the parts manufacturer and the truck manufacturer and was awarded $11.3 million. If you have suffered a spinal injury that was caused by the negligent or intentional actions of others, it is vital for you to hire an attorney who has experience with spine injuries as well as the factors that go into valuing these cases. Spine injury cases may rely heavily on an analysis of your medical records, and they may need to be litigated through a trial and a verdict. Contact our office today to schedule your appointment. Cause/extent of injuries disputed in grocery store accident. $886K. Los Angeles County. Trial to determine if rebar company liable for one or two accidents involving plaintiff. $10.7 million gross. Alameda County. Punitive damages against employer when truck driver uses illegal drugs; $2.1 million. San Luis Obispo County. Orthopedic lumbar injuries disputed in rear-ender. $2.8 million. Sacramento County. Left-turn accident leads to disputed causation. $537K. Los Angeles County. $11.3 million for driver injured when truck’s defective wheel hub fails. San Francisco County. Electrician on job site falls from roof-access ladder. $5.2 million. Yuba County. Disputed injuries and causation to "eggshell" plaintiff, in rear-end accident. $359,485 verdict. Sacramento County.